Lantern-lit lamenting for the militarisation of Australian history and the normalisation of war is national initiative which has drawn forth extraordinary support from local Cairns people, reports peace activist Graeme Dunstan, organiser of the Lamentation event at the Cairns Cenotaph this Sunday evening. "Where ever i have been in Cairns talking up narrative building to counter the 4 year, $300 million government funded promotion of the WW1 centenary commemorations which begins of 4 August, i have been met with goodwill, support and cooperation," he says. "This includes the President of the Cairns RSL, David Clifton, who expressed full support, and also the Cairns Council Permits people who have waived fees, the Cairns Police and also Court officials. Even better of course is the support that has been forthcoming from performers and performance groups offering contributions." "What we aim to do on WW1 centenary eve in Cairns, is create a participatory performance space in which, through spoken word, music , personal story telling and performance we can find the common ground of lament for the trauma that wars bring, even across generations," said Mr Dunstan. "The event will be what people bring to it but just what will happen is yet a mystery," he said. "But for sure i can say it will be beautiful, heart touching and respectful of the dead - all the dead of all the wars." We will recall that the First World War left 60,000 Australian corpses on foreign battle fields and brought home another 60,000 who later died of wounds. We will recall that WW1 was to be the "war to end all wars", but that WW1 created the conditions for WW2, which in turn created this time of Empire, militarised economies, resource piracy and permanent war. "And we will recall the ongoing popular resistance to war and the lies and glorification of war", said Mr Dunstan. "Truly it is only by the power of truth spoken by ordinary decent people that the liars and psychopaths who fight their way to political power, know any restraint to their jingoism, their propaganda lies and delusions of glory." opposite the Cairns RSL 115 The Esplanade Cairns. Mr Dunstan is a 71 year old nomad lantern master and a former comrade of the late and lamented Bryan Law of Cairns Peace by Peace. For the past four years he has been organising lantern-lit Anzac eve Peace Vigils at the Australian War Memorial in Canberra. He has also been supporting the Anzac Day Lest We Forget the Frontier Wars Marches there. 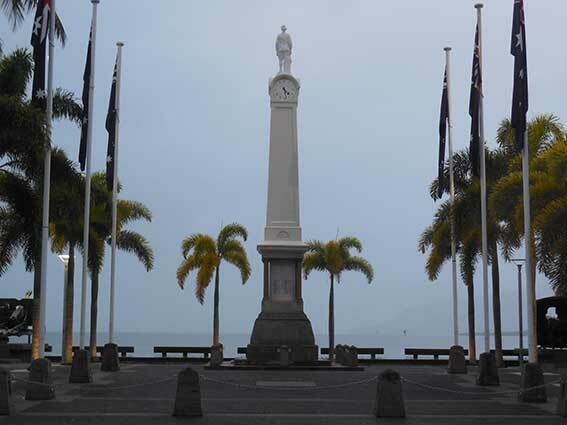 This is the Cairns Cenotaph where our Lamentation will assemble 6 pm Sunday 3 August. It is directly across the road from the Cairns RSL 115 The Esplanade. On 23 July, Graeme met with Cairns RSL President, David Clifton, to explain the event and he is pleased to report that the President endorsed the event with full support.